When the Gospel is Bad News! ...or, What False Prophets Won't Tell You! Cain tried to do things his own way, instead of God's way, and he failed utterly. Please notice in Genesis 4:5 that Cain was angry over the truth. God did not accept Cain's hard work, and self-righteous efforts. What really made Cain upset was that God did accept Abel's lamb sacrifice. Cain hated Abel, because Abel was right. Cain couldn't accept the truth, like so many people. In Galatians 4:16, the Apostle Paul said, "Am I therefore become your enemy, because I tell you the truth?" Cain was hard-headed, stubborn, like so many people are. 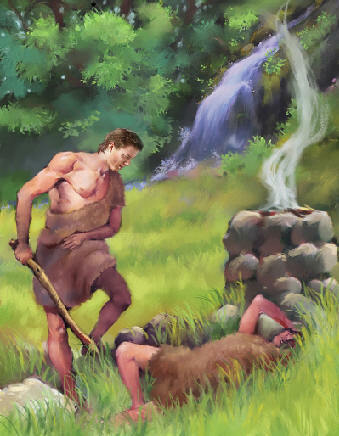 Cain's stubbornness is clearly seen in Genesis 4:8, when he killed his brother Abel. I've witnessed to thousands of people in my life, many of whom were filled with sinful pride, arrogance, and stubbornness against the Truth of God's Word. Having said that, I want to bring your attention to a great deception of Satan within religion today. This great deception is a perverted Gospel, which looks acceptable at a quick glance; BUT, is a Gospel of death and damnation when it is examined more closely. The heart of the matter, of which I am now sharing with you, is this--the Biblical Gospel EXCLUDES all forms of good works, baptism, the Eucharist, the sacraments, dedication, devotion to God, commitment to Christ, turning over a new leaf, church membership, praying the Rosary, confessing to a priest, generosity, supporting a ministry, forsaking one's sins, etc. I say this because many false religions profess to believe the Gospel (i.e., the "good news") of Jesus Christ; BUT, they do not. The Biblical Gospel is more than just telling people that Jesus died, was buried, and rose again--it is also telling them that any self-righteous efforts, to merit salvation, will send them straight to Hell. I was watching a Roman Catholic priest on TV, who was teaching that Jesus died, was buried, and rose again, for our justification. Then he said that it was Jesus' blood that washes our sins away. Then he said that Jesus was Almighty God, and used Scriptures to back it up. I felt like I was listening to a born-again Christian preacher; BUT, I knew better concerning Catholicism, which is why I am writing this article. Any Gospel presentation MUST teach sinners that no amount of self-righteousness, good works, GENEROSITY, or SUPPORTING A MINISTRY, can save anyone. These crooked ministries aren't stupid--they know that if they preach a shallow Gospel, promise healing miracles, and show you a few tear-jerkers (like kids starving in Cambodia or Africa) ... you'll run for the phone with your credit card. That's why Pat Roberson, James Robison, and Benny Hinn take in HUNDREDS-OF-MILLIONS OF DOLLARS EVERY YEAR!!! To no surprise, James Robison refused to disclose his personal compensations from his "ministry" with the Better Business Bureau. Must be in the $$ MILLIONS $$, huh James? Can't offend those self-righteous Cain's out there--they might stop supporting you. If John the Baptist were here today, crying aloud against the wickednesses of our day, do you think he would make the cover of Time Magazine? Do you think he would be filthy rich? Do you think people would like him while he's preaching like Billy Sunday against booze, movies, abortion, homosexuality, feminism, etc. They'd hate him! And that's another thing, you'll hardly ever hear a televangelist preach against sin. Instead, they speak of healing miracles, financial success, and love, love, love. Well, Biblical love is NOT compromise! I'm tired of witches, homos, and other god-haters writing me to throw it in my face that Jesus taught love. Yes, Jesus did teach love; BUT, love is NEVER sinful compromise! Jesus was a "friend" of sinners, not an accomplice. Jesus did not judge sinners, but He took a stand against sin, and preached from the Word of God that DOES condemn all sinners (John 12:48). Was Jesus being loving in John 4:18 when he brought up the Samaritan woman's adulterous affairs? Yes, He was, but it was tough love. Was Jesus being loving in John 2:15 when he tore apart the temple, hitting people with a whip, and throwing all their personal belongings on the floor? Yes, it was tough love! A true man of God will take a firm STAND against all forms of sin. These yellowbellied, spineless, milquetoast, greedy, lying, and exploitive televangelists, who appear as men of God--are in fact, WOLVES in sheep's clothing! Oh how blind and foolish are the masses. Read about Pat Roberson and the 700 Club. Read about TBN. The masses are being led astray from the Word of God. I heard Jack Van Impe, in his 666 video, claim to have spent over 70,000 hours in Bible study; YET, he hypocritically promotes the demonic Pope as a great man. It just goes to prove, that all the Bible knowledge in the world, won't bring a person any closer to God if their heart is in the wrong place. Don't forget what I just said. Where's your heart? The truth needs to be told--trusting in a Gospel which includes good works and self-righteousness is BAD NEWS! What False Prophets Won't Tell You! Just as Cain was angered by the truth that his good works were NOT acceptable to God, so do people today often become enraged when you tell them that their good works are as filthy rags in God's sight (Isaiah 64:6). They say, "What? How dare you tell me that all my good works don't mean anything to God!" It is because of this FACT that televangelists will NEVER talk about this critical subject. I was listening to Benny Hinn the other day. To the ignorant masses of people, Benny Hinn appears to be preaching the Biblical Gospel of Jesus Christ; BUT, he'll NEVER tell you that adding good works to your faith will send you to Hell. A closer examination of Benny Hinn will reveal that he is a Catholic! Benny Hinn is a false prophet who exploits Christianity and the Gospel for personal gain. James Robison and his wife are also false prophets, who appear to be preaching the Gospel; BUT, they'll NEVER tell you that the Biblical Gospel EXCLUDES all forms of good works, baptism, the Eucharist, the sacraments, dedication, devotion to God, commitment to Christ, turning over a new leaf, church membership, praying the Rosary, confessing to a priest, generosity, supporting a ministry, forsaking one's sins, etc. The Biblical Gospel is more than just telling people that Jesus died, was buried, and rose again--it is also telling them that any self-righteous efforts, in an attempt to merit salvation, will send them straight to Hell. Did you know that every Catholic believes that Jesus died, was buried, and rose again? They believe that Jesus is Almighty God. They believe in the Godhead (Trinity). They believe that our sins are washed away by Christ's blood. The average person, who is woefully ignorant of God's Word, wouldn't be able to decipher the Truth from the lies. It is for this very critical reason that every born-again, soulwinning Christian in the world, needs to make sure when they are witnessing to people, that they teach these things. We need to WARN people, that ADDING anything to faith alone in Christ, is NO faith at all. The truth about the Catholic Church is that they teach damnable heresies, leading the masses into Hell. Catholics are taught that Baptism forgives their original sin; BUT, the Word of God teaches that only faith in Jesus Christ as Savior can forgive sin (John 11:25). Catholics are taught that they must show devotion to the Queen of Heaven, Mother Mary, by praying the Rosary, by showing devotion to the Divine Image of Mercy, etc. Catholics are required to keep the 7-sacraments to be saved. Catholicism is a prisonhouse of religion. I am greatly saddened when I hear Catholics talking about the death, burial, and resurrection of Jesus Christ ... talking about the deity of Christ ... talking about the Godhead ...all truthful Biblical doctrines; BUT, then they foolishly ADD all sorts of rituals, devotion to idols, good works, sacraments, and blasphemous manmade doctrines (Mark 7:6-13). How could anyone be SO CLOSE to the truth, and yet SO FAR away? Every Catholic has the saving Gospel of Jesus Christ right in front of their face; BUT, they can't see the forest for the trees! Catholics are willingly blinded, because they have chosen to follow men instead of God. Psalm 118:8, "It is better to trust in the LORD than to put confidence in man." False prophets will come to us ... preaching the death, burial, and resurrection of Christ. They will say that only Jesus' blood can save a soul from Hell. They'll say they believe in the Biblical doctrine of the Godhead. By all initial appearances they will seem like born-again believers. BUT, as you'll find later on, they are false prophets, teaching doctrines of Devils. One such false religion are the Seventh-Day Adventists. Another group is the Jehovah's Witnesses (JWs). Contrary to what most Christians think about the Jehovah's Witnesses, JWs do believe in God the Father, God the Son, and God the Holy Spirit; BUT, they don't believe that Jesus is Almighty God, only "a god." JWs believe that the Holy Spirit is simply God's Spirit, and not an individual Person. The Word of God manifests the Godhead as three distinct, individual Beings (Matthew 3:16,17; Colossians 2:9; 1st John 5:7), and yet One Supreme God (Deuteronomy 6:4). Do you see how clever the Devil is, and how he can sift you as wheat if you don't know the Truth of God's Word? The Biblical Gospel EXCLUDES all forms of good works, baptism, the Eucharist, the sacraments, dedication, devotion to God, commitment to Christ, turning over a new leaf, church membership, praying the Rosary, confessing to a priest, generosity, supporting a ministry, forsaking one's sins, etc. Let us be diligent to teach others the Word of God, to prevent them from believing a false Gospel (Galatians 1:7; 2nd Corinthians 11:3). If we don't speak the truth, who will? All the liars on TV are exploiting the Gospel to make a buck. They are only presenting a shallow Gospel, that many of the cults also believe. We need to tell people that the Biblical Gospel of salvation EXCLUDES all forms of good works and self-righteousness, lest we be guilty of preaching a Gospel which would be acceptable to Cain.